“I still believe in trees,” says Peter Janes, with a hint of a smile. Well, who doesn’t like trees? But his point is not simply that trees are nice (although he agrees that they are). The belief Janes speaks of covers a lot more ground than that: he’s talking about trees as a good business choice, a dietary powerhouse, a permaculture solution, an intelligent response to climate change, and one of the most practical ways possible to live the locavore, grow-it-yourself dream. Janes and his partner Magdalene Joli know a lot about that dream. 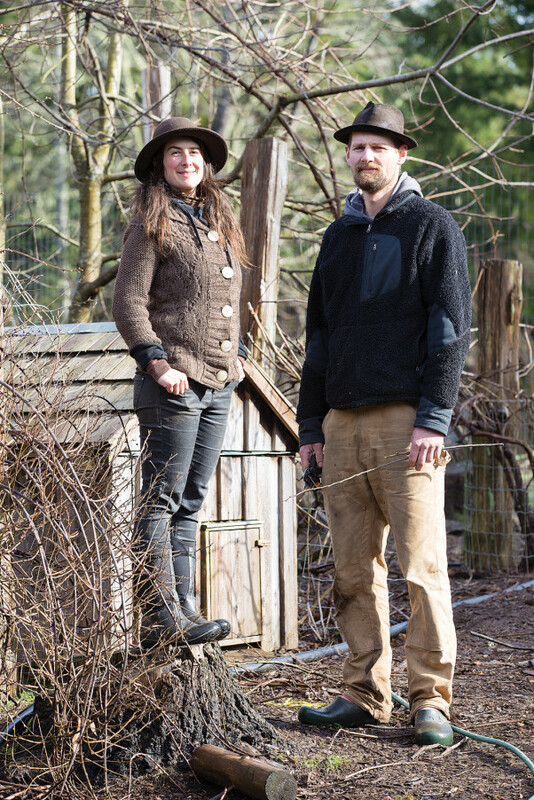 In fact, the two of them would make great poster children for the 21st century small farming movement, with its focus on community connections, organic and permaculture practices, and the politics of food production and consumption. Joli and Janes run Tree Eater Nursery on Denman Island, which by their estimate is Vancouver Island’s biggest and most diverse source of food-producing nursery trees. The farm includes more than 500 fruit and nut trees planted to feed Joli and Janes and their customers, but that number pales beside the several thousand seedlings and cuttings, representing more than 200 varieties, which are in the nursery. These are being nurtured for sale to clients from all over Canada, many of whom turn to Tree Eater for unusual and hard-to-find trees such as persimmon, mulberry, Autumn Olive, kiwi, and super-hardy citrus. “A lot of what we sell is not necessarily pretty,” adds Joli. “But these trees are amazing perennial food plants.” She and Janes have discovered by trial and error what grows and produces well in our region. Their nursery business draws on these discoveries. Joli and Janes both grew up in mainly urban centres before deciding to move to the country, grow food and explore self-sustainability. They brought varying degrees of experience and education. Janes, who has a degree in anthropology and environmental studies and a background in outdoor education, took a permaculture course which, he says, gave him a piece of paper but had little value compared to actual experience on the farm. Joli is a Registered Holistic Nutritionist and a certified herbalist who’d already done a two-year stint of homesteading in the BC Interior, and worked as an organic produce manager, before moving to Denman Island. Since Janes founded Tree Eater in 2003, with Joli joining him in 2007, the couple has explored a spectrum of small-farm approaches—they’ve sold produce, seedlings and bedding plants at farmers’ markets and Seedy Saturdays, operated a Community Supported Agriculture Program (CSA); and provided farm-to-table catering. They’ve built a home using their own lumber as well as straw-bale and natural plaster techniques. They raise goats, chicken and geese, and host occasional community gatherings. Side projects include a traditional tool forge and an outdoor wood-fired clay oven. Janes runs a micro-sawmill, Joli bakes and sells artisanal bread and other baked goodies. All of this takes place on about seven acres of their 40-acre property. After 13 years learning about what works and what doesn’t while negotiating the transition from idealistic 20-somethings to seasoned pragmatists, Janes and Joli say it feels right to focus in on the food-producing trees that inspired the farm’s name. “Really, this is coming back full circle to our permaculture principles,” says Joli. And it’s a climate-friendly approach to producing food. “The trees capture carbon when they are growing, and when you don’t till soil and instead build its organic content in a perennial system, you capture a significant amount of carbon. Tilling soil aerates it and releases the carbon,” Janes explains. Also, says Janes, tree crops are the best source for a healthy local vegetarian diet. “A tree-based diet gives you a totally different nutritional spectrum than vegetables. You get your micronutrients and your oils. It’s the only way to be a vegan and eat locally.” And for people who want to include animal products in their diets, trees can provide an abundant source of animal feed. A 10-year-old hazelnut tree can provide “huge amounts of nuts that can feed a pig easily,” says Joli. For Janes and Joli, focusing on food-bearing trees is a sound business choice that provides a potential answer to a complex question: how can they sustain their lives as small farmers living on a remote island, while staying true to their values? This question has been with them since they first took shovel to soil more than a decade ago, fuelled by youthful energy and ambitious political, environmental and spiritual goals—and it may never be answered fully. “This is a key moment in our evolution,” says Janes. “The original vision was very idealistic and text-bookish—driven by a very pure ideal of permaculture. We had lots of energy. We wanted to try everything you could do on a farm.” And they wanted to do it all themselves, off-grid, and as far away as possible from the global-corporate-capital-government-industrial apparatus which, they feel, is responsible for massive environmental degradation, social inequity, and a world out of balance. The story of how that idealism and enthusiasm survived the clash with the reality of farming on a small, sparsely-populated island in the Salish Sea—or at least, one version of the story—was told in a feature article about Janes and Joli in the online magazine The Tyee in January, 2014, entitled A Homesteader’s Philosophical Dilemma. The article places the couple in a long lineage of “hard-headed idealists” tracing back to Diogenes in Ancient Greece (described as “one of the first back-to-basics freaks in recorded history”) and manifested more recently by the “back-to-the-land” movement of the 1960s and 70s. It describes the farm as a deliberate attempt to make the world a better place, and asks some pointed questions about how realistic this is. Can the actions of a few people in the woods truly make a difference? In the article Janes points out that cutting all ties to the industrial system is “a very tall order” that probably wouldn’t be worth the immense time and energy involved. “I now know by direct experience how hard it is to shift away from the momentum that our society has,” he says. For some people following the back-to-the-land dream, this realization might be cause to give up, but Janes and Joli are more interested in figuring out how to evolve their vision and their practice. Adds Janes: “The trees are idealistic and realistic.” As he’s explained, they hit all the right notes for permaculture and environmental sustainability. But that’s not the only type of sustainability on Joli’s and Janes’ minds—their own economic and lifestyle sustainability is essential. The trees seem able to deliver. They offer a less labor-intensive regime than other types of small-scale farming, and there’s a market for them—a niche market, but a keen one. “We’ve always done pretty well at Seedy Saturdays, but what we’re seeing now are larger orders via online sales. We’re being found by people on the Gulf Islands who want a truckload of our stuff. They want to plant a whole orchard of our trees!” says Janes. Orders have been skyrocketing—he estimates that in February of this year they sold 10 times more trees than in any past month. “It’s incredible. I’ve sold thousands of dollars worth of trees in just the last two weeks,” Janes says. Regardless of how questions of income and ideals play out, Janes and Joli love the life they’ve created. “We live with an amazing amount of bounty,” says Joli. “We eat like kings and queens! That’s one of the reasons I chose this lifestyle and I’d have a hard time giving it up. We have our own meat, vegetables, fruits and nuts and we do a lot of preserving. And it’s wonderful to be able to offer this lifestyle to my son, to give him a childhood where he can run around on 40 acres, and to grow up around people who can build things and fix things and make things. “To be honest, my initial motivation was primarily personal rather than political. Since my early 20s I’ve had lots of enthusiasm and passion for food, and a lot of excitement for living a semi-self-sufficient lifestyle,” she explains. “You have to really want it and be passionate about it!” says Joli, her eyes bright with enthusiasm. Farming takes perseverance. Janes and Joli have seen crops fail and trees die or refuse to bear fruit. They’ve had deer get through the fence and destroy a whole season’s worth of vegetables in one night. But perseverance pays off. This fall, the couple enjoyed their first crop of persimmons from trees planted eight years ago. 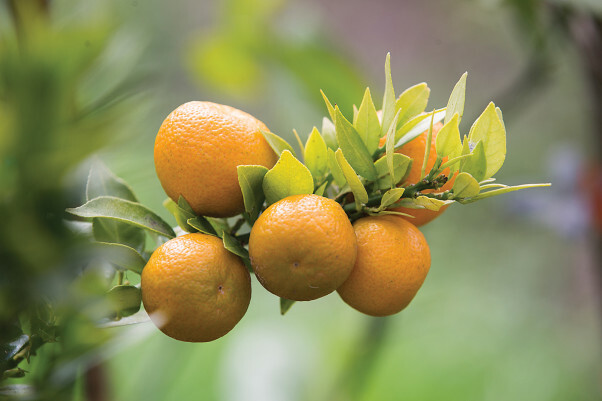 At the time, they didn’t know of anyone else in the area who was growing these late-ripening tree fruits, but they took a leap of faith and planted about a dozen varieties, hoping that at least a few of them would work out. This year they were able to feast on six different varieties, and can now advise potential clients that yes, persimmons can be successfully grown here in coastal BC. Indeed it is, especially in a world that offers the non-stop hyper-dynamic stimulation of social media, YouTube, Netflix, smartphones, and other plugged-in global entertainments. But for someone who believes in trees the way he does, that subtle pleasure is deeply nourishing.